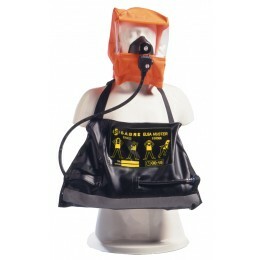 This ELSA Muster is a hooded escape set which also features an emergency air in connection to allow an additional air supply to be used. The set excels in situations where the escape route may require a lot of physical exertion or where the maximum levels of protection are required. Featuring a high visibility flame retardant hood that provides optimal vision and can be worn over spectacles and long hair. This unit is supplied with a 15 Minute Cylinder.